Are you ready for a super summer? 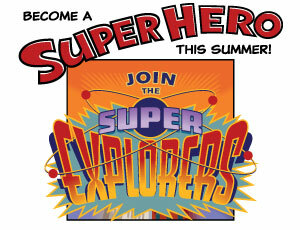 Kids 0 to 13, join the Super Explorers to stop Dr. Brain-Drain at your neighborhood library from June 19 to September 1! During the drop-in Rahm's Readers Summer Learning Challenge, CPL locations offer hundreds of family events, art projects, STEAM (science, technology, engineering, art and math) activities and new books to keep kids' brains active. READ 500 minutes or more over the summer. Read books, magazines, comics, eBooks and audiobooks for at least 20 minutes a day—all reading counts! DISCOVER: Complete at least one hands-on activity. Try a Museum of Science and Industry Brain Game or other STEAM activity, attend a library event, visit a museum or explore something new. CREATE: Make at least one creation. Make art, write a story, design something or try out a new recipe. Share what you read and learn, and earn your book bag. Keep coming back for more chances to win prizes! Kids 0 to 5 who register for the Summer Learning Challenge receive a free book from KPMG (while supplies last). School-age kids can enter our Super Origins contest to win a bag of books. All kids can enter weekly book giveaways and, with the support of Allstate, may even win a backpack of books and STEM activities. Parents and caregivers who read, discover and create along with their children will receive a book bag with a special luggage tag (while supplies last) and will have a chance to win a tech package. Rahm’s Readers is in partnership with the Museum of Science and Industry, the City of Chicago, the Chicago Park District, Chicago Public Schools, Art Institute of Chicago and Bernie's Book Bank. Rahm’s Readers is made possible by The James and Madeleine McMullan Foundation, Allstate, Boeing, Dr. Scholl Foundation, Helen M. Harrison Foundation, KPMG, William Blair, Macy's, RR Donnelley, Cubs Cares (a fund of the McCormick Foundation) and PNC Bank, through the Chicago Public Library Foundation.